Caspase-3 DEVD-R110 Fluorometric HTS Assay Kit is specifically designed for HTS-based assays. The kit provides a homogenous assay system for fast and highly sensitive detection of caspase-3 activity by fluorescence in enzymatic reaction or mammalian cells. The fluorogenic substrate (Ac-DEVD)2-R110 contains two DEVD tetrapeptides and is completely hydrolyzed by the enzyme in two successive steps. Cleavage of the first DEVD peptide results in the monopeptide Ac-DEVD-R110 intermediate, which has absorption and emission wavelengths similar to those of R110 (Ex/Em= 496/520 nm) but has only about 10% of the fluorescence of the latter. Hydrolysis of the second DEVD peptide releases the dye R110, leading to a substantial fluorescence increase. 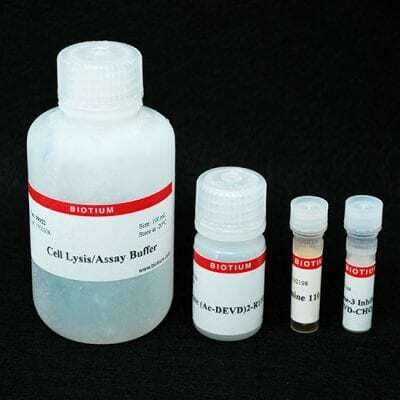 The assay kit includes Ac-DEVD-CHO, which is a caspase-3 inhibitor and can be used as a negative control. Also, R110 is provided in the kit for generating a standard curve, which can be used for quantifying caspase-3 activity. One mL cell lysis/assay buffer is sufficient for 10 assays in 96-well format. For real-time detection of caspase-3 activity in intact cells, see our novel NucView® Caspase-3 Substrate.